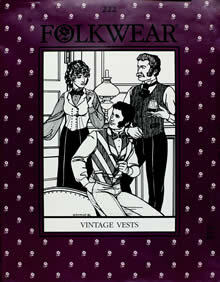 Victorian gentlemen needed a vest or waistcoat to be considered well-dressed, and smart Victorian women often paired vests with walking skirts for street wear. Our vests offer a variety of stylings, including collarless V-neck, bias-cut vest with shawl collar, and short front-darted style. Traditional bow tie, with instructions for tying, is also included. Misses 6-16; Men's 36-44.